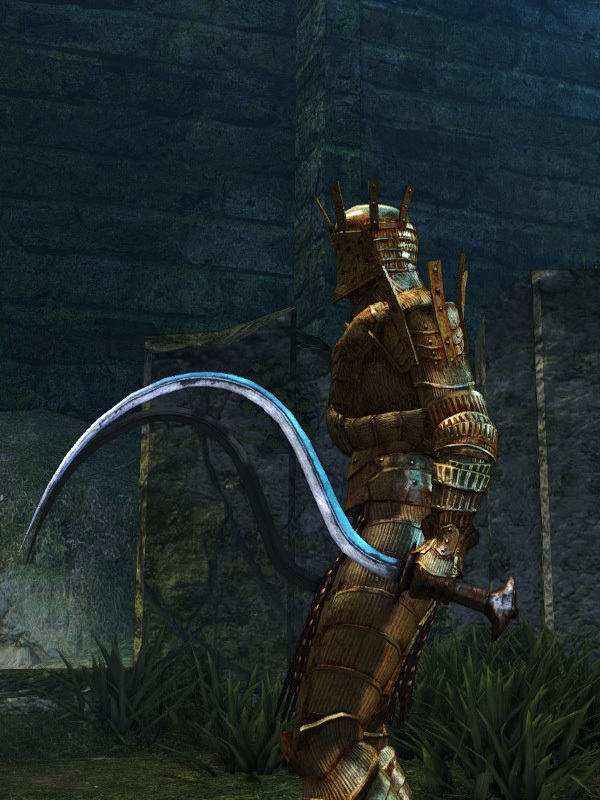 Curved sword with sharply curved blade. Created by Arstor, Earl of Carim. shield defense to sneak in damage. Drop off near the top of the long slope (next to the Serpent Mage) near the first encounter of the huge rolling iron balls, just before the room where the Ring of Steel Protection is found. This weapon's strong attacks go through shields. R1 — R1 — Alternating horizontal slashes. R2 — R2 Double overhead slash into horizontal slash. Roll — R1 Fast left-to-right horizontal slash. Backstep or Run — R1 Upward vertical slash. Forward + R1 Horizontal slash followed by backwards cartwheel. Useful as an evasive attack. L1 (left hand) Left-to-right horizontal slash. R1 — R1 — Fast alternating horizontal slashes. Very fast and often spammed. R2 — R2 Double over head slash into rising vertical slash. Weapon durability reduced to 12. Base damage increased. Cannot repair weapon (except through reinforcement). 15% STR, 72% DEX scaling. 11% STR, 55% DEX scaling. 4% STR, 21% DEX, 63% INT scaling. 3% STR, 15% DEX, 61% INT scaling. Unknown additional amount of INT scaling. 6% STR, 28% DEX, 62% FAI scaling. Additional damage multiplier against unholy enemies. 5% STR, 26% DEX, 73% FAI scaling. Additional damage multiplier against holy enemies. Adds fire damage. All stat bonuses removed. Base damage reduced from fire upgrade path. Increased damage bonus from humanity.